LAHORE: (Friday, April 6, 2018): Punjab University Faculty of Health Sciences has organized its first two-day sports gala at Undergraduate block. PU Vice Chancellor Dr Muhammad Zakria Zakar, Dean Faculty of Health Sciences Prof Dr Muhammad Syed Awasi, Chief Medical Officer Dr Tehseen Zameer, senior faculty members, doctors and students were present in the concluding ceremony. In his address, the VC said that games for physical and mental development were very important. He hoped that in future students from faculty of health sciences would play their role to improve the healthcare system of the country. Badminton, cricket, ludo, football, race etc competitions were held for the students. 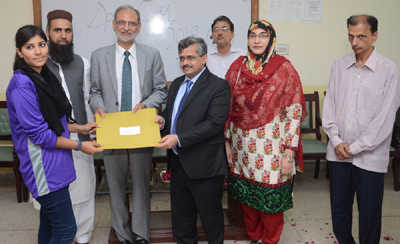 Later, Dr Zakar presented appreciation letters and prizes among successful students.